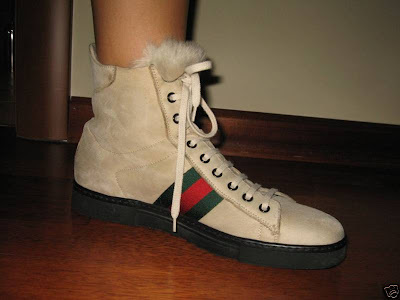 Currently on sale at Ebay.com, are these fabulous Gucci beige high top sneakers in suede, from Tom Fords last collection at Gucci, which retailed at $980 and are available to buy it now for $525. So, you can imagine my delight, when I found a pair of these in my local Salvation Army charity shop yesterday for £4.99!!! Wow, that is a fab bargain, plus they fit like a glove-the suede is deliciously soft and my pair are in tip top condition! The thrift find of the week, most definitely! Holy crap, Sharon! You've outdone yourself! WOW! I can't believe someone gave those away to the charity shop!! You're a girl after my own heart! I'm "blackbelt" - in shopping! awesome! You so know what to look for. Very cool shoes! At a very cool price. How sweet. Those are too cute! Great eye! Hi there-thanks so much for your lovely comments everyone! 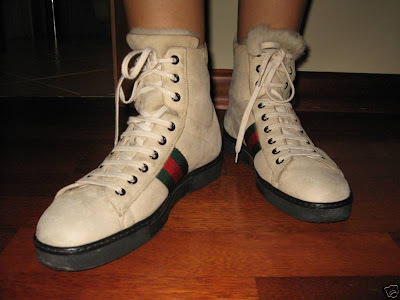 Wendy, I was very surprised at what they were when I found them on ebay, I knew they were Gucci, but from Tom Fords last collection too! Ladies who Lunch, yes, I'm surprised too, maybe they didn't fit the previous owner? Still their loss is my gain! Wow thst is amazing, the title should be thrift find of the year! You did NOT! Lady you have the most astonishing thrifting luck EVER! thanks so much for the note. I'm sure those are comfortable shoes too. I love, love, love these shoes! That's a great bargain you found. Salvation Army thrift shop now! Wow, is that fur? You totally got a bargain missy!! One word. Jealous! Oh, Jealous. Fab find, my dear! Hi everyone-thanks for the lovely comments, I think they are fur lined, but not sure what sort of fur though! Sharon! I can't get over your latest purchase. I need to go down to Essex. wow, it was a bargain!! i think you are the person I have been feeling more jealous about in my whole life!! I won't ever forget your Chanel jacket, and now this!! lucky you!! Hi Ladies-so kind of you, thanks for the fab comments! What a find, Sharon! Congrats! Hi 444-LOL, I was very surprised when I realised how much they were originally too! Sharon, what I love about YOU is that YOU love it ALL!!! !